As any coach can tell you, the success of a rugby practice correlates well to the amount of planning and preparation. And using themes to plan a rugby practice is a great organizational method that will improve your training sessions. Planning your rugby practice around a theme has many benefits, not the least of which is shorter preparation time. Focusing on a specific theme makes selecting drills and games for your practice plan a quick and easy task. Themes also provide a great framework to modify your “everyday drills” to match the theme. For example, if the theme of my practice is “Decision-making after the tackle”, then I will plan warm-up drills that prepare players for both contact and decision making. After the warm-ups, we’ll move into specific drills and mini-games that focus on either the tackle or decision making. As the players master each of these areas, we progress to drills/games that combine both tackling skills and decision making. By using themes to plan a rugby practice I found that I could reduce my planning time by about 50%. This is invaluable for volunteer coaches like myself but it is also important for paid coaches juggling many responsibilities. 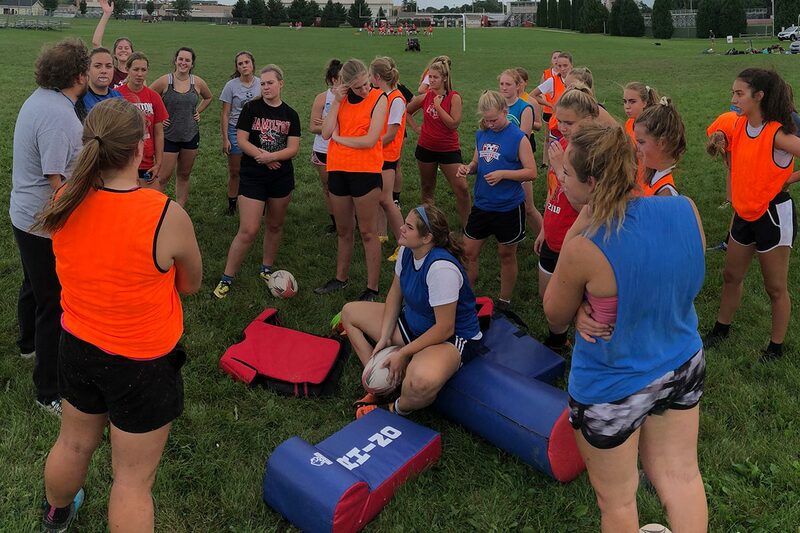 Another benefit of using themes to plan a rugby practice is the affect on player engagement, skills mastery, and the retention of knowledge: themes improve all three. In other words, using themes leads to more successful practices. Part of this success is due to the simple fact that the organization of theme-based practices is better and training sessions are thus more efficient. But I believe that the success of a theme-based training session results primarily from the way a theme affects the minds of the participants. Themes help focus the minds of the players at practice in the same way that a theme focus a coaches ideas in the planning phase. By introducing and reinforcing the practice theme throughout the session you will give a purpose to the activities. This is more meaningful than completing a drill “because Coach said so”. And as the players improve their mastery of the theme, their minds will process the information in a deeper way. They will start to think about when they could have used these skills in the past and of course how the skills will be applied in the future. Once you’ve engaged the minds of the players, knowledge retention will take care of itself. In addition, you can expect to get more questions from the players. I’ve found that players are more attentive when there is a “question and answer” session. And if you’ve really done a great job at planning your session you can expect the players to discuss the theme among themselves. These are the times as a coach when you can feel some pride for a job well done. In the most simple example, every practice focuses on one theme. But reality is rarely simple. As a coach you must decide how may themes to focus on in any given period. While it’s counter-productive to have multiple themes in a single practice, the reverse is NOT true. A single theme might require multiple sessions. In some cases, you’ll want to stick to the same theme all week. In other cases, it may be more effective to return to the same or a related theme weekly. As you can see, these themes are not specific. You must adjust both the specificity and complexity of these themes to match the skill and experience of your team. What themes do you use to plan your rugby practices? I’d love to hear your answers in the comments below.